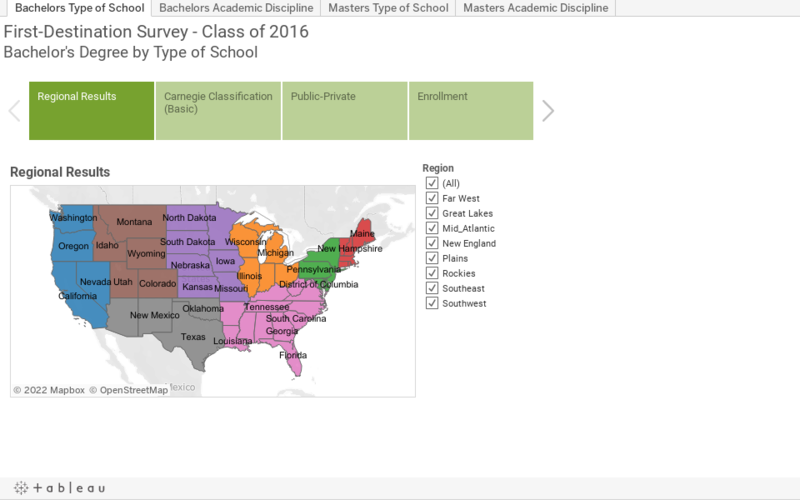 The report for the college Class of 2016 is the third set of first-destination data for undergraduates, and the second set of data for graduates with advanced degrees. Overall, NACE received responses from 350 schools/career centers detailing results for their bachelor’s degree graduates; 53 schools reported data for associate degree completers; 144 schools provided information for those earning a master’s degree; and 81 institutions reported results for doctoral degree recipients. In total, the graduating classes of these reporting institutions represent more than 650,000 graduates; this includes 516,000 at the bachelor’s degree level; 11,000 at the associate degree level; 110,000 at the master’s level; and 17,700 at the doctoral degree level. To our knowledge, this represents the most comprehensive view of graduate outcomes currently available. Overall, outcomes for Class of 2016 bachelor’s degree graduates trailed those of their Class of 2015 counterparts. The percentage employed declined as did the percentage in an advanced degree program. The average starting salary also decreased. However, these negative trends were not dramatic. Overall, 81 percent of 2016 bachelor’s degree graduates were employed or in graduate school within six months of graduation. More than half landed in a full-time position with a traditional employer (53.4 percent), and 17.5 percent were continuing their education. Just over 16 percent reported that they were still seeking a job or further education. In terms of securing full-time employment with a traditional employer, by location, bachelor’s degree graduates in New England fared best (64.1 percent), while those studying engineering technology came out on top of other academic disciplines (72.3 percent). Among bachelor’s degree graduates, the average starting salary was $49,525, down approximately 1.4 percent from the 2015 average ($50,210). More than 70 percent of master’s degree graduates secured full-time employment with a traditional employer within six months of graduation. The differential between master’s and bachelor’s degree salaries was approximately 32 percent.